When you ask a room full of bloggers what their blogging moment would be when they would know that they have made it, they would say that it is when their favourite brand contacts them and offers to work with them. Let’s face it, we all know that it is not as easy as that and it can take years of hard thankless work before a brand even notices your content. Let alone asks you to work with them and shock* actually pay you for it. This week’s FBL Chat looked at working with bloggers. Q1: Tell us about whether you have worked with brands and how was your experience? Q2) How do you go about approaching a brand for a collaboration? Q3: Do you think brands are receptive to working with micro bloggers? · I haven't done it yet, but I like to think that I'll use media kits to "promote my work" and prove my creativity. I want to come in with ideas and show my motivation! · I think ignoring the recent bad press blogging has received, that companies realise we are a great resource to have and will utilise that. They just need to learn, like them, we all start off small and we need to work together to help each other out. · I think brands eventually learnt from their past mistakes, and understand that smaller influencers are just as good to work with for them than bigger ones. Fingers crossed, that'll come sooner than later. 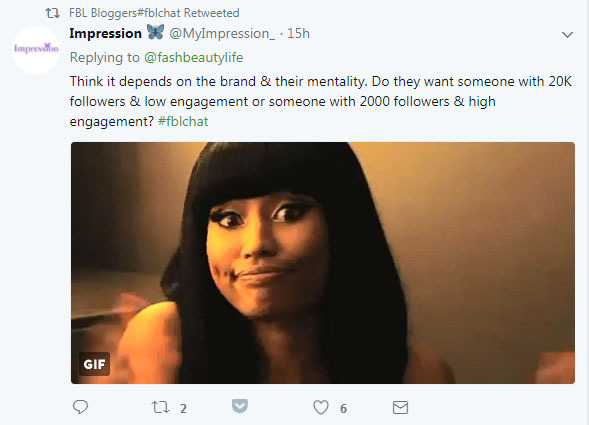 · I'm hoping it will turn into climbing up with influencers that supported them from the beginning and like everyone helping everyone and it not relying so much on follower numbers. · Think there will be a lot more opportunities. However, I think there will also be a lot more people wanting to work with brands. So it's all about standing out from the crowd. Thank you for joining us on the chat, don’t forget to join us on Tuesdays at 8pm for our next one! Older PostNew Year, New Blog.. FBL Chat returns!